We are living through not one but two crises of capitalism. The first one – the economic crisis which has followed the financial crash of 2008 – everyone knows about. The second is less familiar. This is the crisis of the global environment. Of course environmentalists have been warning of ‘environmental crisis’ for over 50 years, whether from the chemicalisation of food, air pollution, rainforest destruction or climate change. But I use the term in its original Marxian sense. A crisis of capitalism occurs when the dynamics and forces of the system build up costs and risks to such an extent that they end up undermining themselves, creating a self-perpetuating spiral which can only be escaped through state intervention – by governments effectively saving capitalism from itself. This is of course precisely what has happened in the economy since 2008. An unsustainable boom in lending and credit, driven by a huge expansion of the financial sector, led to an asset price bubble and subsequent collapse, followed by a retrenchment in spending, leading to loss of output and rising unemployment. The slump into which these events pushed the economy could only be escaped via massive state intervention – initially in bailing out the banks, and then in huge injections of demand, first fiscal (stimulus) then monetary (quantitative easing), a process which is still not complete in any of the major Western economies. This is a crisis of capitalism in the precise sense that capitalist dynamics undermined the system, almost bringing it down, and could not then correct themselves without assistance from the state. The environmental crisis is now of the same kind. This is most obviously the case in respect of climate change. It is now clear that the global economy cannot continue to burn fossil fuels as its main source of energy: the carbon embodied in them, if released into the atmosphere, will cause changes to the climate not seen since the last Ice Age. As the World Bank warned recently, present emissions trends will lead to global warming of at least 4 degrees Centigrade by the middle of the century, triggering “a cascade of cataclysmic changes”, including more frequent weather-related disasters, declining global food stocks and sea-level rise affecting hundreds of millions of people. [i] As the Stern Report showed, even leaving aside the human cost, the economic losses caused by such events would be equivalent in this century to the cost of the two world wars and Great Depression of the last. [ii] In its continued investment in fossil fuels, capitalism is undermining itself. Now look at Figure 2. 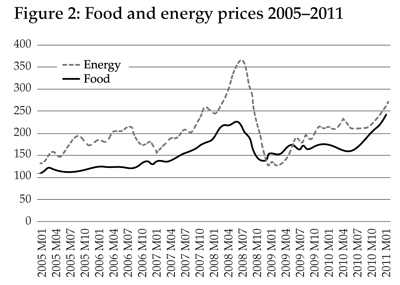 It shows world food and energy prices over the last six years. In 2008 both spiked, then nosedived as the financial crisis took an axe to demand. But since then, while global economic growth has recovered only slowly, food prices have risen back above their 2008 peak, and oil prices are today above $100 a barrel. Why? Because supply cannot keep pace with demand. The environmental crisis now is not just one of excess pollution, but of inadequate supply of resources – the inability of the global environment under present economic conditions to provide enough energy, food and other commodities to meet demand at stable prices. Of course, these rising prices are already bringing forward new supply – that’s a natural feedback mechanism. But in no field is new supply keeping pace with demand. And the cause is not difficult to find. With a sixth of the world’s people, China’s annual 7-8% growth rates are sucking up unimaginably large quantities of resources. China consumes more than half of the entire world’s output of cement, and more than a third of its iron ore, steel, coal, lead, zinc, aluminium, copper, nickel and even pigs and eggs. [iv] It simply is not possible for an economy so large to grow so fast without impacting on the global availability of resources – and of course on the carbon emissions and the habitat loss which also accompany the industrial engine. These price rises are already slowing China’s growth down, and in turn slowing the growth of the rest of the global economy. In the past, environmental costs were largely imposed on the economic periphery – air pollution in poor urban areas, toxic waste dumps, the depletion of fish stocks and destruction of rainforests. No more. Now resource scarcity is affecting prices right at the heart of the global economy, where substitution is difficult and productivity improvements are not keeping pace with the growth of demand. For example, there is a remarkable correlation between energy price spikes and US recessions over the past forty years. With only one exception, a doubling of the oil price has always been associated with recession in the US, at the same time or soon after. And it’s not difficult to see why. Energy is a significant cost in all developed economies and a doubling in its price has a significant effect on both output and consumer spending. One of the reasons why economic recovery is so difficult today is precisely because of this under-noticed phenomenon: as soon as growth gets going again, scarcity-driven energy prices rise and choke it off. What does all this mean for the left? It means we have to enlarge our understanding of both capitalism and social democracy. Modern social democracy came into being in the 20th century to manage a capitalism which was unable to manage itself. In the first half of the last century Western capitalist economies undermined their own processes of accumulation and growth by their inability to provide proper welfare for their workers. Low incomes, poor housing, inadequate education and ill-health led to low labour productivity, and inadequate consumer demand for the products capitalism generated. When the financial crisis of 1929 hit, capitalism fell into slump and could not get out of it without state support – in the US through Roosevelt’s New Deal, in Europe through rearmament and ultimately war. After 1945 social democrats (and in continental Europe, Christian ones) rescued this failing capitalist system from itself. They created welfare states, secondary and tertiary education and national health systems which prevented absolute poverty and raised labour productivity. Strong trade unions raised labour’s share of national income, which in turn raised demand for consumer goods and services. Governments nationalised key industries to ensure investment in infrastructure, and used Keynesian fiscal and monetary policy to maintain full employment. At the same time social democrats set out to use the products of wealth creation to achieve their cherished social goals – a reduction in inequality, universal social security, comprehensive education and the promotion of arts and culture for all. The parallels with today are evident. Once again it is only governments which can rescue capitalism from the slump into which it has fallen. But the traditional social democratic programme will now not be enough. Today we also need to manage the environmental impacts of a system rapidly destroying the foundations on which it rests. That means regulating the resources and energy that flow through the economy so that they stay within sustainable bounds. We know how to do this. The price of carbon needs to be high enough to make the burning of the most polluting fuel, coal, unprofitable, and to drive investment in energy efficiency. So long as they remain more expensive than fossil fuels, renewable energy sources such as wind and solar need to be subsidised through price support such as ‘feed-in tariffs’. The variable generation from renewables needs to be backed up by nuclear or gas, eventually fitted with carbon capture and storage technology, and by interconnected ‘smart’ grids which ensure that electricity can flow from wherever it is being generated to wherever it is needed, with demand adjusted to supply. Fuel for transport needs gradually to shift from oil to a decarbonised electricity system. Meanwhile we need to use pricing, regulation, land use planning and public spending to stimulate investment in resource efficiency in every sector from agriculture and water to minerals and materials. Public support will be needed for research and development of new green technologies. We need to limit polluting wastes and restructure consumption patterns to stimulate re-use and recycling. We need to limit the harvesting of fisheries and forests to their long-term sustainable yields. Precious habitats must be protected by creating greater value from their conservation. In many of these areas we need to come to international agreements to ensure that some countries do not free ride on the efforts of others. None of this is theory any more. In countries and industries across the world, the sustainable management of the earth’s resources is being practised. But it is not happening in enough countries, or enough industries, and with not enough urgency relative to the patterns of growth and resource use which are now leading us into crisis. So this is social democracy’s new task. In the past this would not have been easy. Traditionally the left saw environmental protection as a luxury which could only be afforded once wealth had been generated. Environmental policies which imposed costs on industry risked damaging growth and destroying jobs. Environmentalism was a minority middle class movement, with no economic interests underpinning its politics. This change in the economics of environmental protection is of vital importance to social democrats. For it changes the politics. When social democracy rescued 20th century capitalism from itself it did so through a powerful coalition of forces. At its base was the working class, organised through trade unions and social democratic and labour parties. But critical too was the support of a significant proportion of the business community, and the middle classes who worked in it. For enlightened businesses could see where their real interests lay – not in the ‘free market’ dogmas of those who purported to champion capitalism but whose laissez faire policies could not get the economy out of depression, but among those who wanted to use the state to stimulate demand and therefore to create the markets for business investment and output. The business class by means universally supported social democratic parties and governments in the post-war period, but enough of them split apart from their ideologically backward-looking peers to create decisive support for the Keynesian programme and the creation of the welfare state. Yes, this involved giving a larger share of their profits to the workers and to the state in taxes; but the benefits in terms of the growth of demand for the goods and services they produced more than outweighed the cost. So just as social democrats in the 20th century forged a cross-class, cross-industry coalition in favour of the welfare state, so social democrats today need to forge a comparable alliance in favour of the environmentally-based economy. Green politics is no longer simply about a middle class environmental movement: that is a vital constituency – four million members of the National Trust, and nearly a million members of local wildlife groups shows that the values of environmental stewardship form a powerful counterweight to those of consumerist materialism – but it is now joined by powerful economic interests. Towards the end of the last Government, it looked as if the Labour Party had begun to understand some of this. Its pioneering 2008 Climate Change Act set environmental (carbon) limits, and required by law that the economy live within them. It created a national economic strategy, the Low Carbon Transition Plan, which in turn led to the development of a low carbon industrial strategy and the invention of the Green Investment Bank. It joined with its partners in the EU to develop a low carbon European economy through the 2020 package of emissions targets, carbon pricing and renewable energy. In its Policy Review today the party needs to develop this further. It faces a particular challenge to redefine the role of the state. A green social democracy will require smarter and more active economic government. It will need to use a variety of interventions – the tax system, regulation, industrial policy and public investment – to help steer the economy onto a more sustainable path. It will have to work not only at the national and local levels, but internationally. The European Union will be a critical part of this transition, to make the world’s biggest single market a driver for global environmental standards. A green social democratic state will have to forge an active equality policy, so that environmental costs do not fall most heavily on the poor. And it will have to find new ways of creating public consensus, so that the implicit contract between present and future generations is understood and can be sustained. None of this will be easy. It will require radical thinking in Opposition, and determination in Government. But that is precisely how social democrats built the welfare state economy in the 20th century. We will have to do it again for the green economy of the 21st. [i] World Bank, Turn Down the Heat: Why a 4C Warmer World Must be Avoided, 2012. [ii] N Stern, The Economics of Climate Change: The Stern Review. Cambridge University Press, 2007. 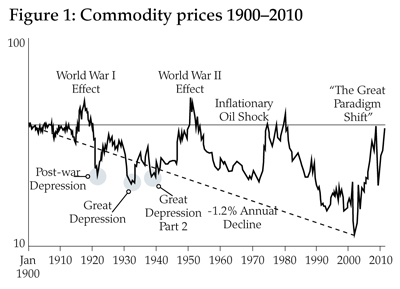 [iii] J Grantham, ‘Time to wake up: days of abundant resources and falling prices are over forever’, GMO Quarterly newsletter, April 2011. [v] J Rockstroem et al, ‘A Safe Operating Space for Humanity.’ Nature, 461 (24), 2009. [vi] Department for Business, Innovation and Skills, Low Carbon Environmental Goods and Services; Report for 2010/11, 2012. Grantham Research Institute on Climate Change and the Environment Working Paper, LSE, 2012. [viii] CBI, The Colour of Growth: Maximising the Potential of Green Business, 2012. [ix] TUC, Unlocking Green Enterprise: A Low-Carbon Strategy for the UK Economy, 2009.